It’s summatime in Louisville, Kentucky ya’ll. 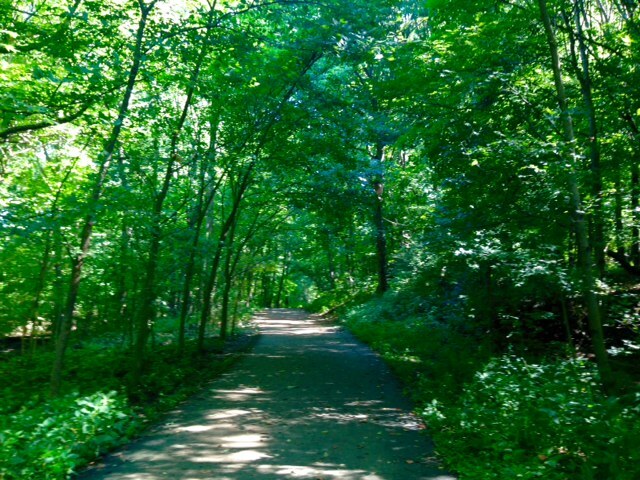 Cherokee Park is in full bloom; a canopy of lush green covers my head when I make my way through the wild flower strewn Scenic Loop Trail. I’m pleased to report the pool water has achieved a tepid warmth, and the sky is clear and blue. These are the days, the ones I longed for through an unusually intense winter that saw my car buried with snow and a prolonged wet and soggy spring. But somehow it wasn’t enough this time. I needed something more. Something more intense, something more sweaty. 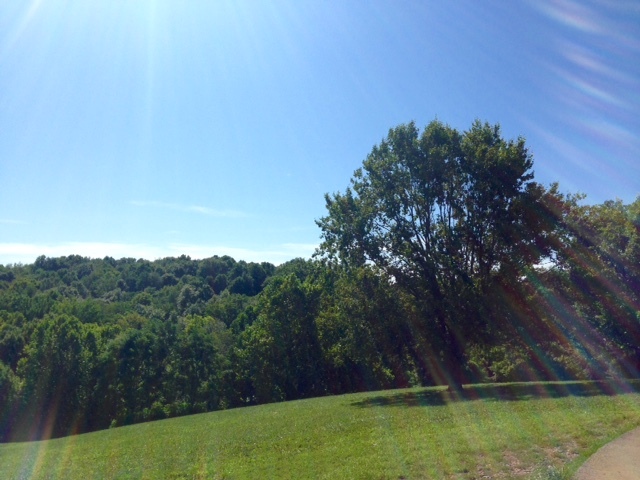 Cherokee Park: nothing at all to do with food, everything to do with how much I love my new Kentucky home in the summer. As I walked into the bright sunlight from an early morning session of hot yoga this July, I chuckled. It’s almost as hot out here as it was in there, I thought to myself. See, I usually save hot yoga for the winter when the trails of Cherokee Park are dangerously icy and the trees are bare and foreboding. The 110 degree room that smells of an accumulation of sweaty bodies, poorly cleaned yoga mats, and expensive Lululemon leggings that should have been washed days ago is a welcome respite to the chill that stays in my bones from December through March. But as summer came around this year, I was feeling off and found myself unconsciously doing tree stand poses in the kitchen while making dinner. I’d been swinging by the gym and frequenting my favorite park for trail runs almost daily, but I still felt like something was missing. So I swallowed my pride and my fear and the hunk of meat that was probably in my mouth when I made the decision to allow Betsy’s Hot Yoga to hit up my credit card on the regular. My goal is to do hot yoga everyday I’m able for the next month to see if I can deepen the comfort I feel in my own skin (now glistening with sweat from a challenging session). We’re constantly bombarded with the newest data on diets and exercise regimens that will make us look like Gisele or J. Lo. I find myself voraciously reading articles on metabolic cycles, food combination, and the many health benefits of apple cider vinegar, trying each one in turn, but feeling more confused and dejected with each new attempt. As regular readers of Amy Burns the Recipe Book know, my boyfriend and I have been following the Paleo diet since almost the start of the year. David has seen incredible improvements as a result, but I wouldn’t call myself a cavewoman convert to the no-carb, heavy meat lifestyle. And so I’ve decided to stop obsessively reading Mind, Body, Green articles on Facebook and return to what feels right to me. I prefer a plant-based diet. Yoga stops my neurotic mind from racing. And writing to share my story soothes my soul. Enter this week’s totally veggie, yet entirely filling, main dish: Indonesian Peanut Noodles. Inspired by a Noodles and Co.’s dish, I’ve been working to perfect this meal for years. It’s spicy, salty, creamy and the array of colorful vegetables give it a nice crunch. The noodles are made of brown rice so my gluten-free followers can devour this number without fear of uncomfortable bloat. What diet and exercise regimen comes naturally to you? When does your body wake up before its alarm, power through the day without caffeine, and fall asleep peacefully after a busy workday? I’m curious, let me know your story in the comments section. Once you’ve prepped your veggies, all of the next steps take place in rapid succession, with the whole dish coming together in about 15 minutes. Each step in completed while another part of the dish is cooking, so you’ll need to multitask here. All three of the cooking components, described in more detail below, start at the same time. Place your water for the noodles on to boil at the same time as you sauté your veggies and get your sauce started. 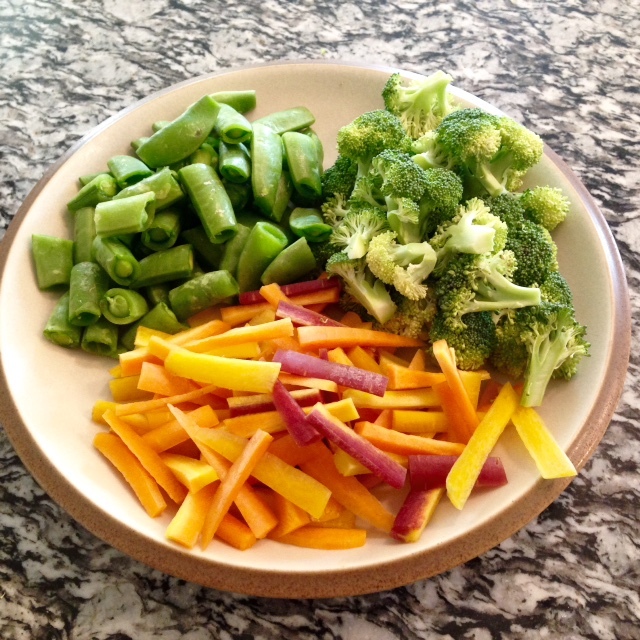 I like the multicolored carrots from Whole Foods – so fancy! While waiting for the water to boil, combine sauce ingredients in a medium sauce pan, whisk throughouly to dissolve the nut butter, and bring to a boil. Once the sauce starts to boil turn down to a simmer and let cook for five minutes, stirring occasionally. At the same time you start cooking your sauce, add a tablespoon of olive or coconut oil to a large sauté pan (with tight fitting lid) and cook your veggies on medium-high heat for about 5 minutes, stirring occasionally. By the time your sauce is done, your veggies should also be tender. Turn off the heat on both pans. This is the sauce before it’s cooked. It looks kind of funky, but fear not. 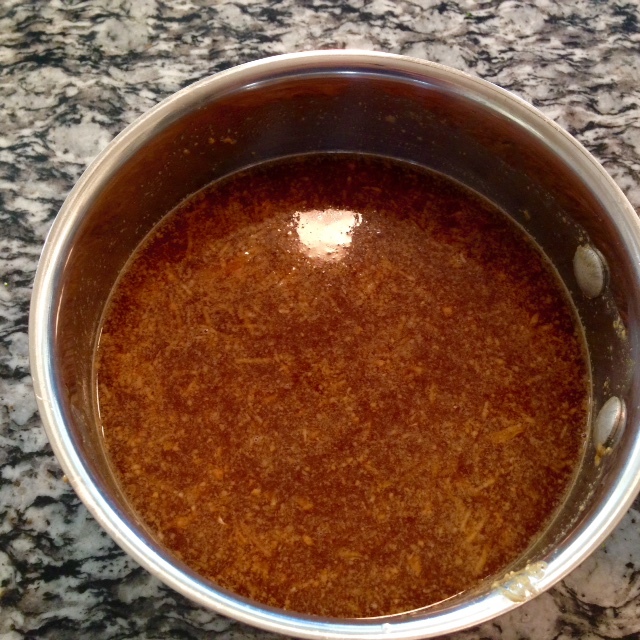 The nut butter melts as you heat it and it becomes a homogenous sauce. Add a tablespoon or two of salt to the boiling water, add the noodles, and cook for 4-5 minutes. Drain and place the noodles on top of the veggies in the large sauté pan. Add the sauce to the top and toss to coat the veggies and noodles evening. Cover the pan and let sit for 5 minutes. The sauce will seem too thin when you pour it over the noodles but it tightens up significantly when allowed to sit for a few minutes. 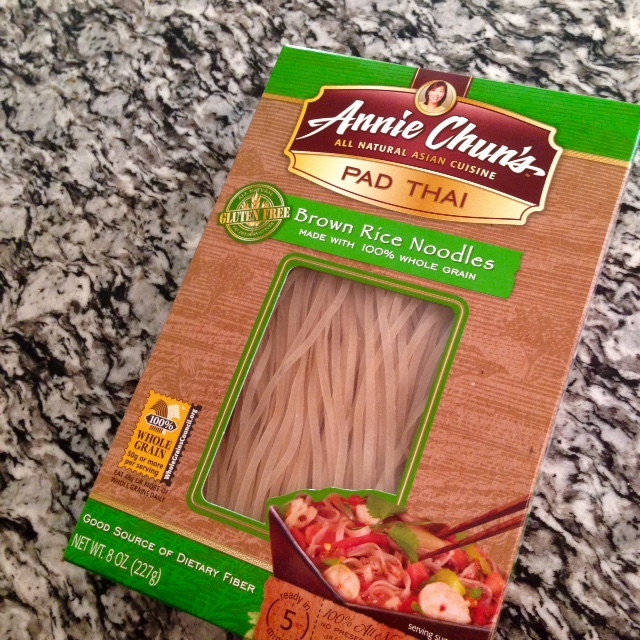 My brown rice noodles of choice. No preservatives or other weird additive. Just brown rice and water. 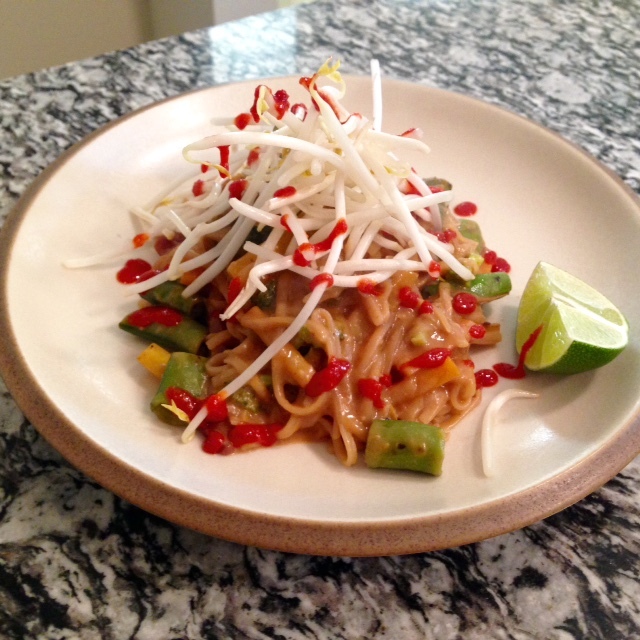 Serve and top with bean sprouts and additional sriracha and lime, if desired. Note: My kind and generous boyfriend usually edits my posts before I throw them up on the blog. I asked him to pay close attention to the directions on this one, because it was difficult to explain in writing how all the parts of this dish came together at once. He was kind enough to provide the chart below for your clarity. Gahhh, I love him! Minute 0 Bring a large pot of water to a boil. Minute 1 Add a tablespoon of olive or coconut oil to a large sauté pan (with tight fitting lid), add your veggies, and cook on medium-high heat for about 5 minutes, stirring occasionally. Combine sauce ingredients in a medium sauce pan and bring to a boil. Minutes 2-6 Once boiling, turn down to a simmer and let cook for five minutes stirring occasionally. By the time your sauce is done, your veggies should also be tender. Turn off the heat on both pans. Minutes 7-11 Add a tablespoon of salt to the boiling water, add the noodles, and cook for 4-5 minutes. Minute 11 Drain the water and place the noodles on top of the veggies in the large sauté pan. Minutes 12-15 Add the sauce to the top and toss to coat the veggies and noodles evening. Cover the pan and let sit for 5 minutes. The sauce will seem too thin when you pour it over the noodles but it tightens up significantly when allowed to sit for a few minutes. Time to Eat Serve and top with bean sprouts and additional sriracha and lime, if desired.